Need a quick, delicious dinner on a busy weeknight? Look no further than this Cuban Cube Steak. 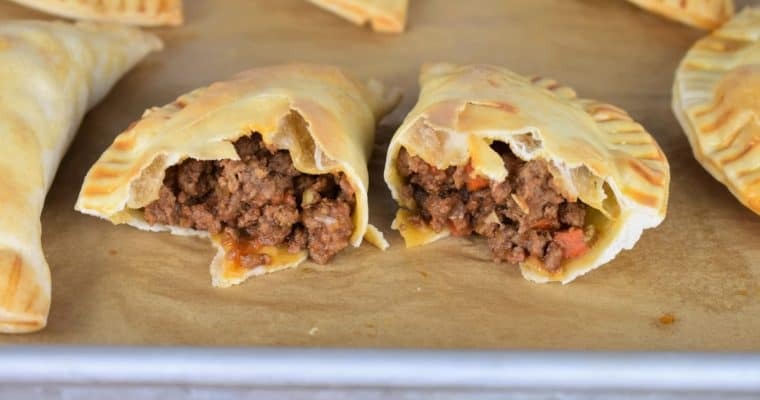 It’s quick, easy and super flavorful. Using cube steak saves some cash too, since it’s inexpensive yet tender. Serve the steaks with a side of white rice and beans for a complete meal that’s affordable, delicious and filling. If you want to go all out, make these tostones as a side dish. If you’re looking for more easy Cuban-style meals, try this chicken steak or this amazing bistec en cazuela. Enjoy! Season the cube steak with salt, garlic powder, dried oregano, cumin and black pepper. Heat the oil in a large, skillet over medium-high heat. When the oil is hot add the cube steak to the skillet. Cook the steaks about 3-5 minutes on each side, depending on the thickness. Keep the steaks warm by covering loosely with aluminum foil, or place them in the microwave or oven to keep away from drafts. Do not wash the skillet. Immediately add the sliced onions, place the skillet back over low to medium-low heat. There should be enough residual heat in the skillet to cook the onions. Stir the onions frequently and cook until they start to soften. 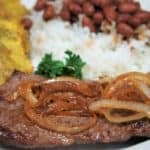 Serve the Cuban Cube Steak with white rice, red or black beans and tostones for a great Cuban-style meal. Add one or two cans of red or black beans to a saucepan – do not drain. Add a sprinkle of garlic powder, onion powder, a pinch of dried oregano and cumin. Then add a heaping tablespoon of olive oil and a teaspoon of red wine vinegar (two of each if using two cans). Give the beans a good stir and heat to a simmer for 10-15 minutes, stirring occasionally. 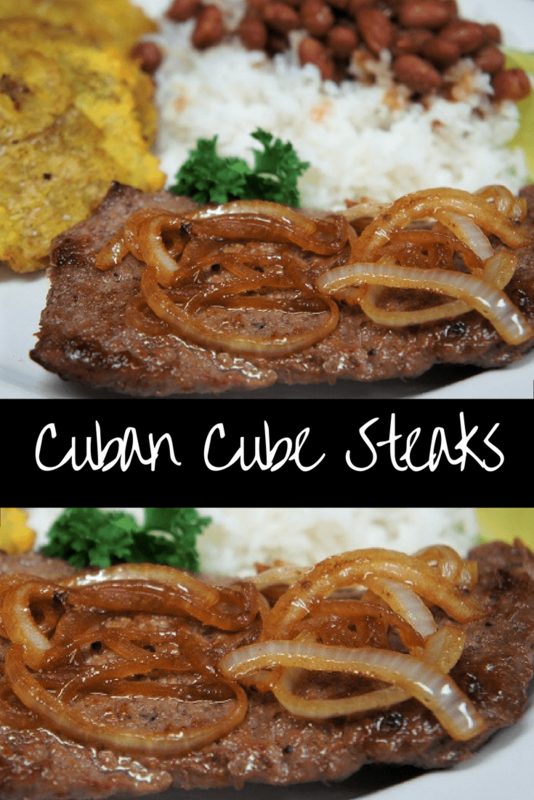 This Cuban Cube Steak is quick, easy and super flavorful. 4 Cube Steaks about 1¼ lb. Season the steak with salt, garlic powder, dried oregano, cumin and black pepper. Heat the oil in a large, skillet over medium-high heat. When the oil is hot add the cube steak to the skillet. Cook the steaks about 3-5 minutes on each side, depending on the thickness. Make sure the steak is browned on the outside, and then continue cooking to the desired doneness. Remove the skillet from the heat, place the steaks on a plate or pan. Keep the steaks warm by covering loosely with aluminum foil, or place them in the microwave or oven to keep away from drafts. Immediately add the sliced onions, place the skillet back over low to medium-low heat. There should be enough residual heat in the skillet to cook the onions. Stir frequently and cook until they start to soften. 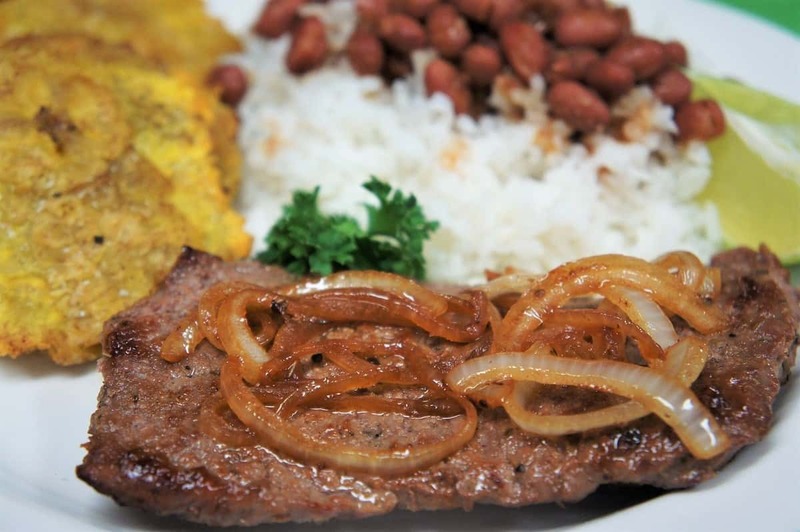 Serve the Cuban Cube Steak with white rice, red or black beans and tostones, if desired. To give the beans a Cuban flair: Add one or two cans of red or black beans to a saucepan – do not drain. Add a sprinkle of garlic powder, onion powder, a pinch of dried oregano and cumin. Then add a heaping tablespoon of olive oil and a teaspoon of red wine vinegar (two of each if using two cans). Give the beans a good stir and heat to a simmer for 10-15 minutes, stirring occasionally.